Knowledge of first-order systems and exponential functions is necessary to understand basic pharmacokinetics. This interactive simulation is designed to illustrate the exponential nature of a first order system to learners without background in mathematics or physics. Particles move randomly about a table with a hole. The more particles there are on the table, the more drop through the hole. A plot over time of the number of particles remaining on the table is an exponential. The particles are analogous to drug molecules, the table is analogous to a compartment, and the hole is analogous to drug clearance in the circulation. 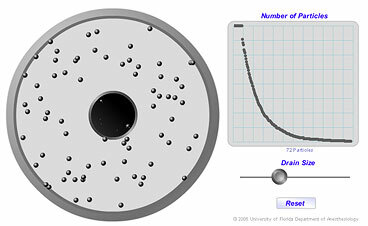 Users can adjust the size of the hole by clicking and dragging the slider on the slider bar and observe the subsequent effects on the exponential decay plot. Plots from two consecutive runs with identical settings will be slightly different because of the stochastic nature of the simulation, but it is useful for visualization purposes, especially for the lay person. A version with two compartments that displays second order behavior is also available below.